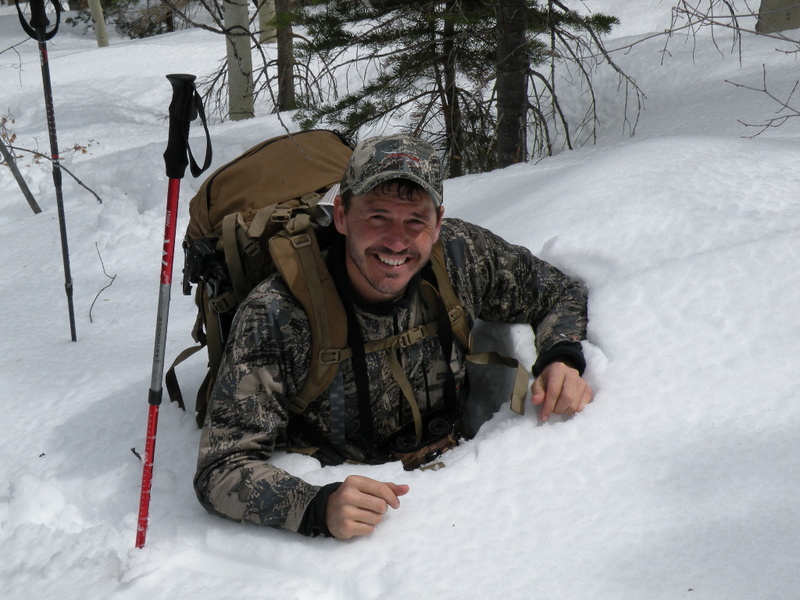 When the talk turns to hunting whitetails, Montana is probably not the first state that comes to mind for prime whitetail habitat or notable whitetail hunters. 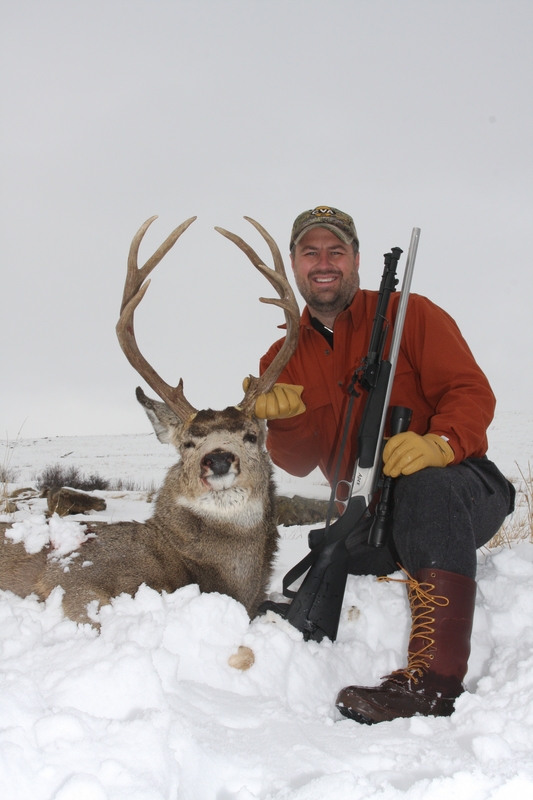 Although Montana does boast large numbers of whitetail deer and some incredible habitat to hunt them, the state is definitely more known for the excellent elk and mule deer hunting. 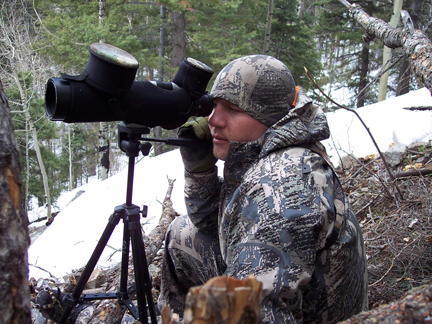 Tune in below to watch noted Montana elk hunter and Sitka Athlete Mark Seacat pickup a few pointers from whitetail authority and TV Personality Jeff Simpson. Jeff and Mark will be teaming up this fall on some exciting whitetail hunts! Be sure to visit us as www.schnees.com and check out all of the best clothing, footwear and gear to help make your whitetail season a comfortable and successful one. The latest whitetail inspired clothing from Sitka in the all-new GORE® OPTIFADE™ Big Game Forest is moving fast as is the incredible selection of women’s camouflage from Prois. Schnee’s also carries the finest hunting boots available to keep you warm and comfortable during those long sits in the stand or box-blind. SITKA GEAR 40-50% Off Sale! 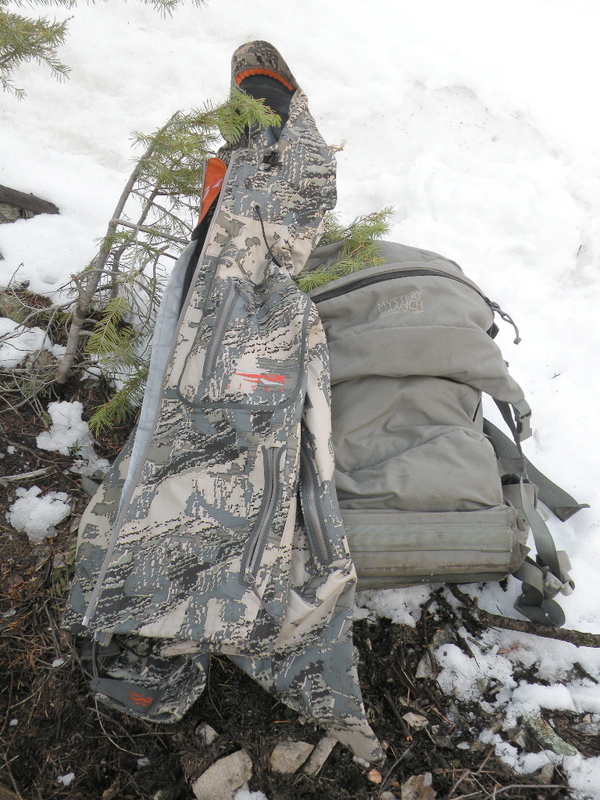 Sitka Gear Mothwing Mountain Mimicry camouflage apparel & equipment is on sale now at Schnee’s for 40-50% off. Core layers, pants, shirts, jackets, vests, packs, caps… this is a great way to add to your Sitka Gear collection or to get your gear at a great price. Includes the Sitka Gear Coldfront Jacket, Coldfront Pant, StormFront Jacket and Stormfront Pants, Traverse Bottom, Sitka Core Zip-T, Sitka Gear Core Crew, Sitka 90% Jacket and Pants, the Sitka Gear 14 Ascent Pack, the 45 Bivy Pack, the Flash 20 Day Pack, Celcius Bib, Ascent Pant, Celcius Hat, Traverse Beanie, Traverse Glove… Lots to pick from, great depth of merchandise. This sale is also ongoing at Schnee’s Powder Horn Outfitters in Bozeman, Montana. Here’s a photo of the great bull Jason Matzinger got during his archery elk hunt just outside Bozeman, Montana a few days ago. Jason & Jon Edwards host Powder Horn Montana television – and this fair chase, spot and stalk hunt was caught on video and will be showcased soon on the show. Archery elk hunting is one of the greatest sports in the world. 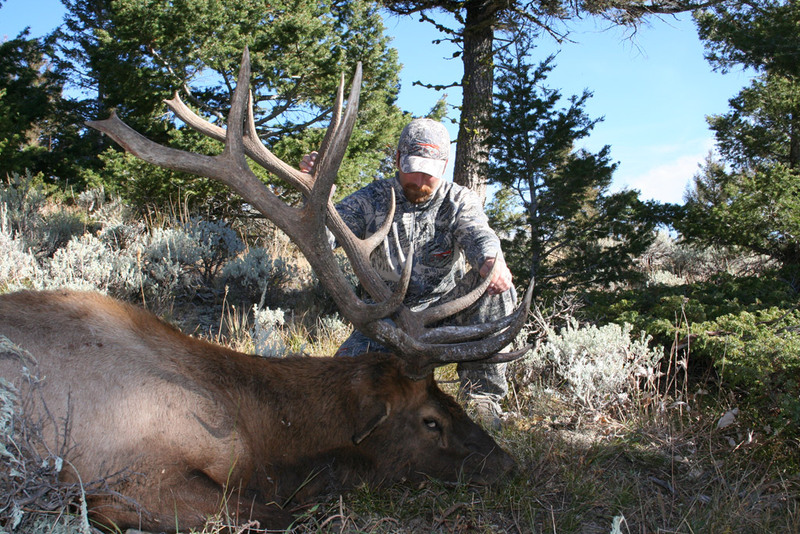 Be sure to watch Powder Horn Montana TV on the Sportsman Channel to see other big game hunts, archery elk hunting tips, great videos of bull elk, and more. 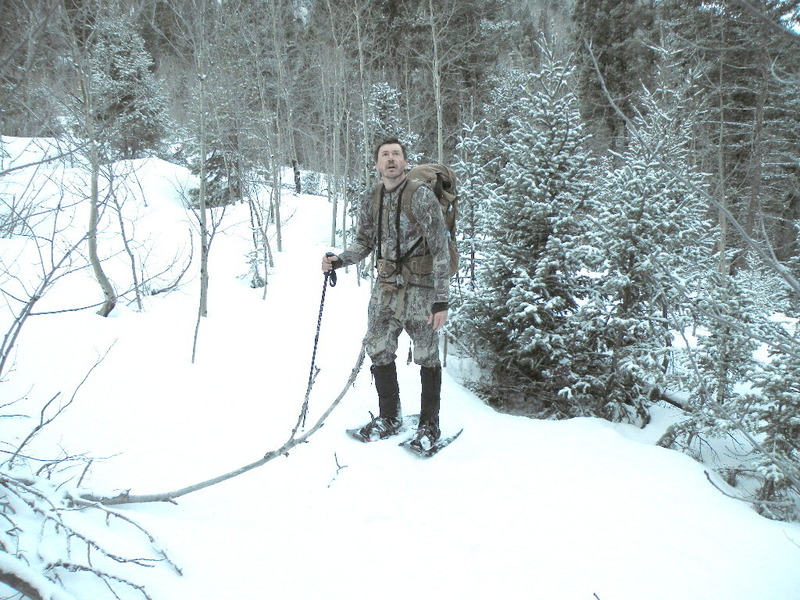 This Sunday’s episode is a new one featuring Jon & Jason’s goat hunting trip in British Columbia! Congratulations to John Avanzato – looks like a great sheep! I’ll give you a little background on this hunt. The Taos Pueblo Indian Reservation is located in Northern New Mexico. Each year the tribe auctions off two Bighorn ram permits at the FNAWS banquet. These tags are a top revenue producer for the Taos pueblo’s well-run game and fish department, and helps fund some of their wildlife management endeavors. 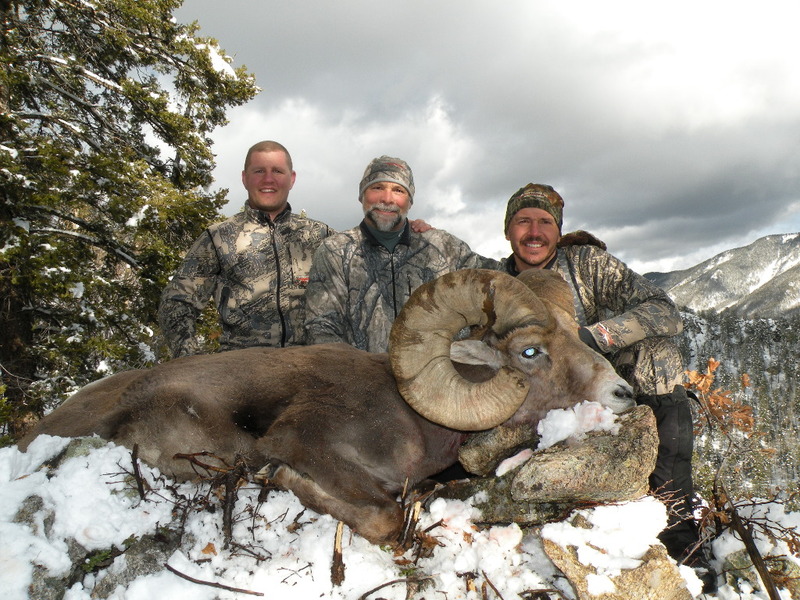 Over the years this hunt has produced many top end Boone and Crockett bighorns including the state record (198) in 2005. 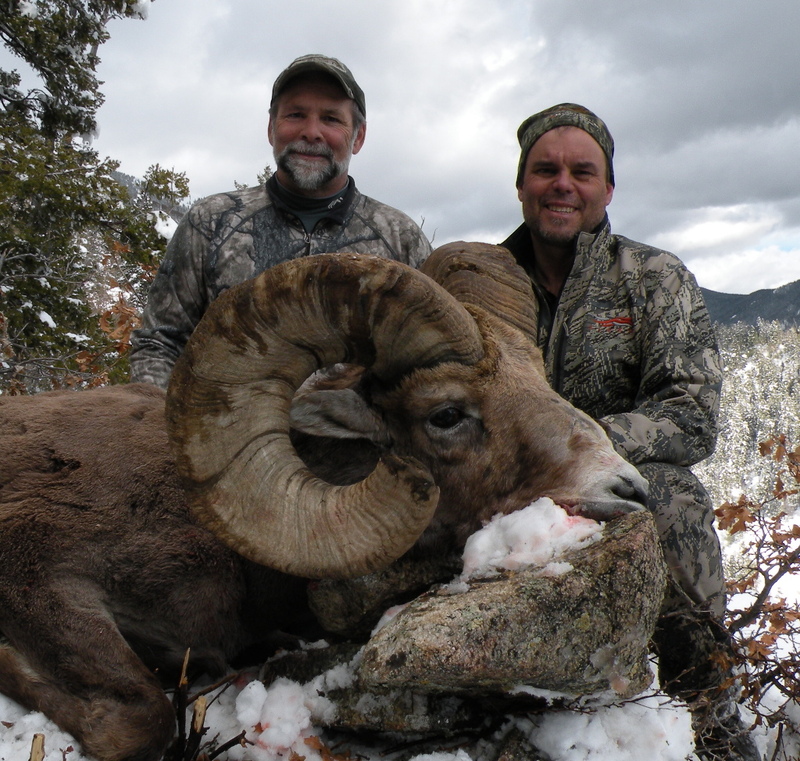 With a reputation for great age class and score this is the best sheep hunt in New Mexico. 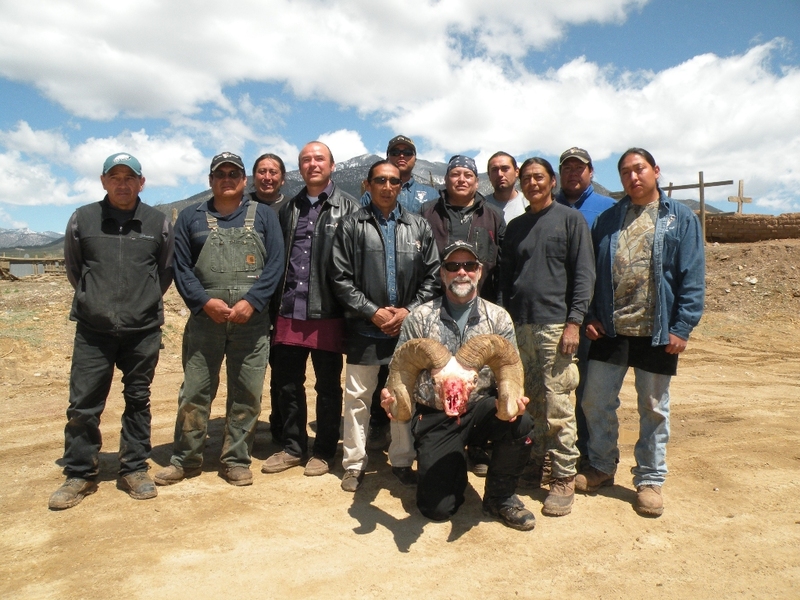 I was invited to go along in this hunt by the Taos Pueblo Warchief and his staff, Outfitter Jon Barker, and head guide Willie Hettinger. The lucky winner of the tag at the Wild Sheep show was hunter Greg Strait. 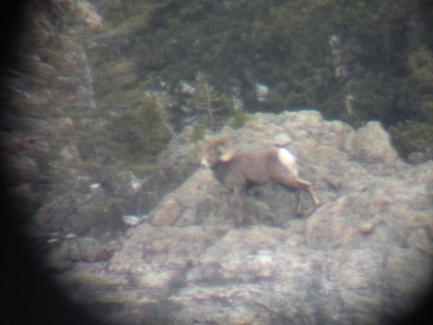 I knew the hunt was going to be a difficult one (most sheep hunts are), but two hours into the mountains it was clear this was going to be harder than I expected. I was prepared for deep snow, cold temps, and long days of glassing. What I wasn’t expecting was the amount of timber where we were looking for rams. I have never grid searched so much timber in all of my life. Over the course of seven days I only saw sheep one time in what would be considered typical sheep habitat. The rest were in heavy cover. Can you see a ram in this photo? Me either! 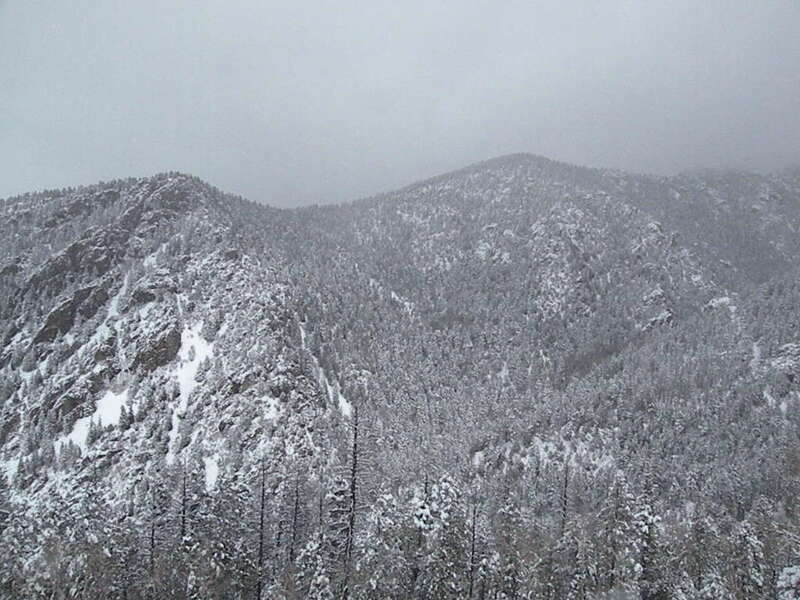 The elevation where we were hunting was from 8,700 to 12,000 feet, and most days we were getting 2 to 6 inches of snow. Our tent camp was at about 9,000 feet, five miles up a large drainage. Snow depth varied from 6 inches to 8 feet. Virtually the whole hunt we were either in crampons or snowshoes. Willie Hettinger thinking about putting on snowshoes. Just about deep enough! 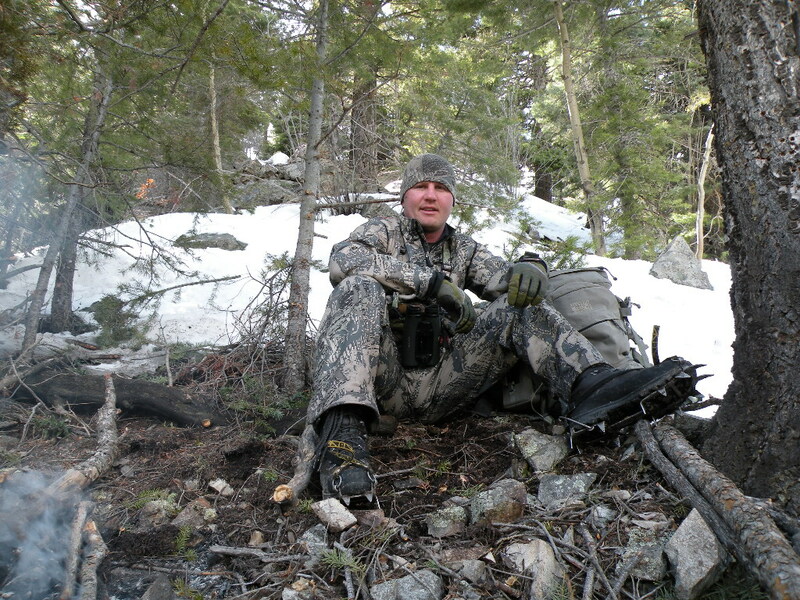 Standard gear for the hunt- Crampons, Schnee's Sheephunter boots, Sitka Optifade gear, and Mystery Ranch Pack. Standard gear for the hunt- Crampons, Schnee’s Sheephunter boots, Sitka Optifade gear, and Mystery Ranch Pack. 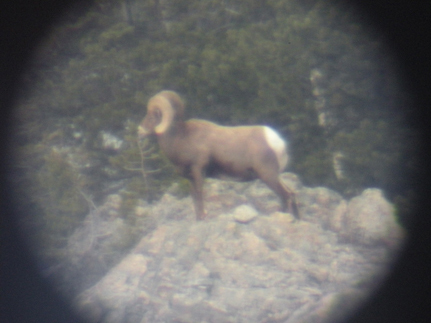 The target ram on this hunt Jon and Willie had a long history with. Nicknamed “Chip” four years ago after they watched him bust out a large piece of his left horn, Jon and Willie had pursued him unsuccessfully with four separate hunters. 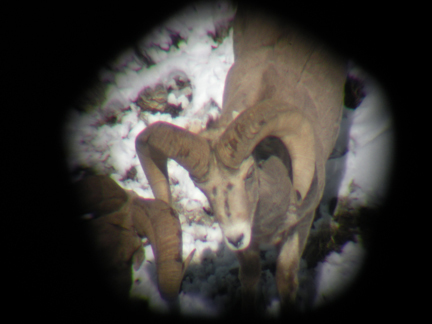 If he was still alive, they both estimated him to now be 11 1/2 years old, and score in the 188-190 range, which could make him quite possibly the largest ram alive in New Mexico (NM has not produced a ram scoring over 185 since 2005). 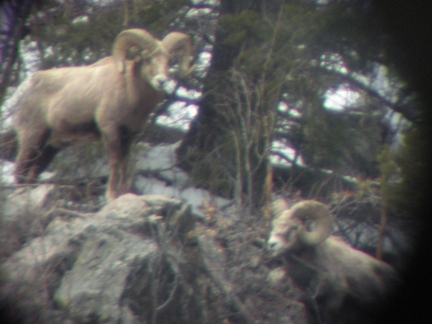 Over the first couple of days we were able to locate 23 different rams ranging up to the high 170 class. 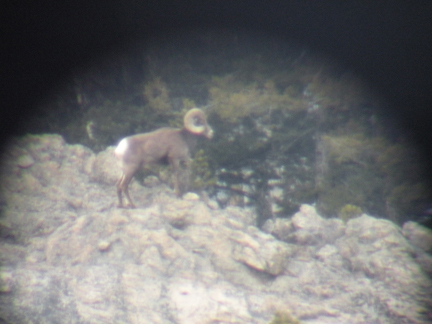 After burning our corneas out for three days looking at snow and timber we caught a break and I got a glimpse of a big ram going over a ridge at 11k feet. The next morning Willie hiked up to a vantage point and positively identified “Chip”. The hunt was on. 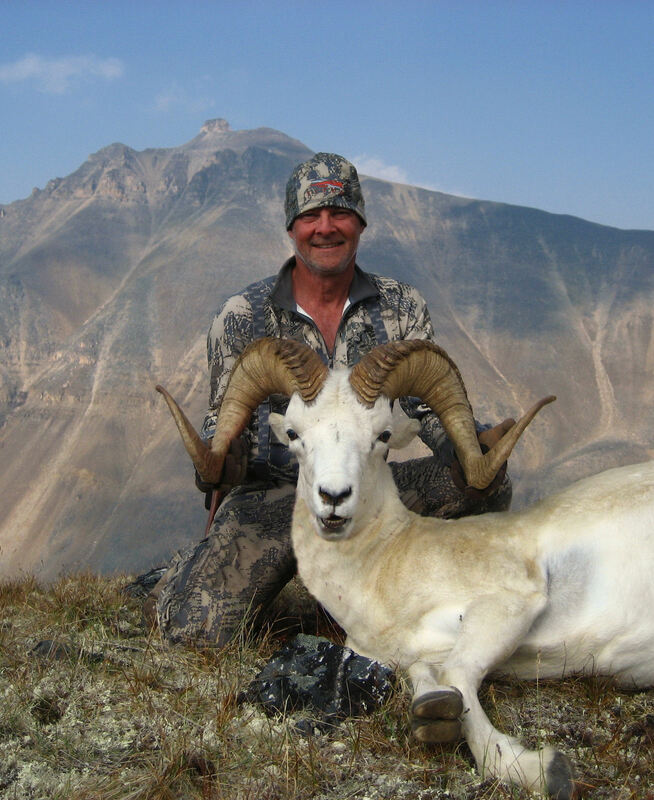 I will spare you the blow-by-blow details of the hunt, but it culminated three days later at over 10k feet, with Greg making a fantastic 455-yard cross canyon shot on “Chip”. He turned out to be all that we expected, scoring 188 3/8 inches at 11 1/2 years old. His third quarter measurements are 11 inches. 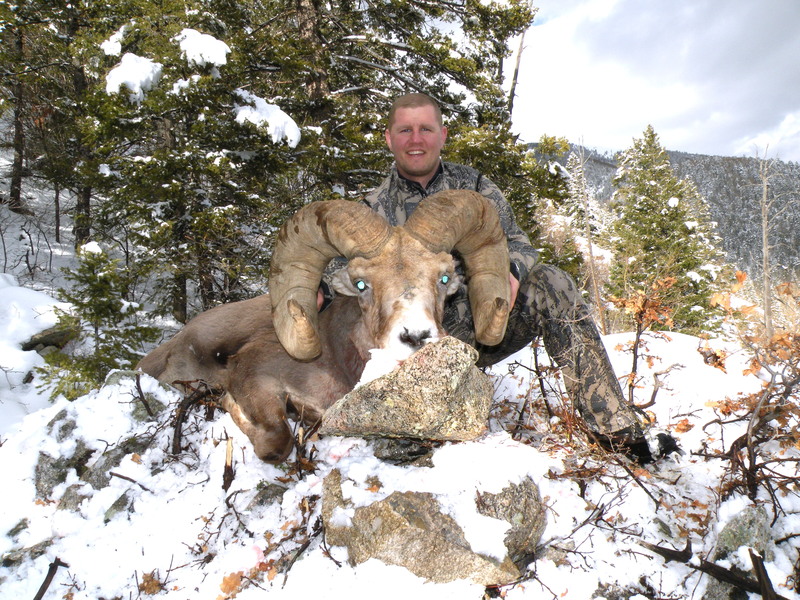 He will be in the top ten rams ever killed in New Mexico. Hard not to smile with a massive old ram and great scenery. It doesn't get any better than this. Now for a little on the gear we used. I wore one set of Sitka Optifade for the entire seven days in the mountains (90% pant, core shirt, core underwear, vest, stormfront jacket, gloves, beanie, etc). I had planned on getting out to the trailhead at least once for a fresh set of clothes, but it didn’t work out that way. Aside from some fresh socks that I packed in, I hunted and slept in the same clothes for 7 days strait. No problem. Everything kept me dry and warm the whole time. I am continually amazed at how fast Sitka Gear apparel dries out. Pack cover or jacket… no water or wind is getting through. 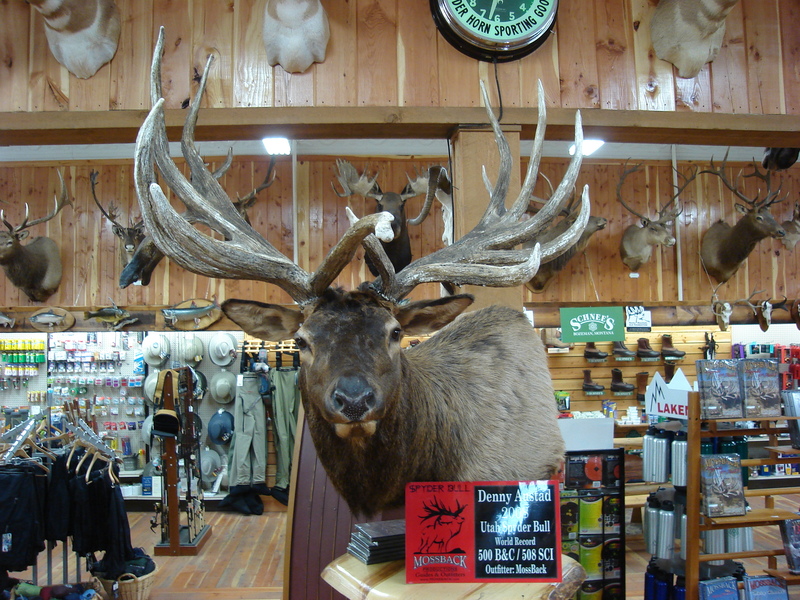 The World Record “Spyder Bull” Elk is on display now at the Powder Horn from May 29-31. We’re very excited to have this event at the store and have a lot of special things planned during the three days. Doyle Moss and the Mossback Pro Staff team will be on-site Saturday, May 30th to demonstrate elk bugling & give clinics and helpful advice. Sitka Gear representatives will also be on-site. We will be displaying the Sitka Gear OPTIFADE camouflage system. Powder Horn Pro Staff Brendan Burns & Jason Matzinger will also be on-site during the Spyder Bull event. Additionally, lots of SITKA caps, Schnee’s Powder Horn Montana caps, and MOSSBERG DVDs will be given away throughout the duration of the event. We’ve also brought in some Springfield Arms XD pistols and plenty of boxes of all sizes of ammunition for this event so there will be lots to look at and purchase.